In Croatia and central Bosnia, Catholic church leaders, particularly Cardinal Kuharic of Zagreb, Archbishop Puljic of Sarajevo, and Father Petar Andjelkovic OFM, the superior of the Franciscan Province of Bosnia, have specifically and courageously condemned the crimes of Croat religious nationalists. In Herzegovina, however, the Catholic clergy played a different, more troubling role. The view of Slavic Muslims put forth by some Herzegovinian clergy differs little from nationalist Serb views. A local Herzegovinian priest offers a pilgrim to Medjugorje a portrait of Herzegovina under the Ottomans that differs little from the history of Ottoman occupation given by the Serb clergy: lurid tales of tor ture without acknowledgment of the long history and complexity of the relationship between the Franciscans and the Ottomans. When European mediators attempted to reconcile the Catholic and Muslim population of Mostar, they were opposed by elements within the local Catholic clergy such as Tomislav Pervan, the provincial superior of 250 Franciscan friars in the Mostar region, who repeated the Tudjman propaganda that the Bosnian Muslims wanted an Islamic state. Friar Pervan went on to say that "Islamic states don't have free speech, democracy, or freedom of religion," ignoring the irony of such a statement made in the wake of the brutal persecution of Bosnian Muslims by Serb and Croat religious nationalists, in the name of Christian states. In the Herzegovinian town of Bobani, a Franciscan priest, the Rev. Vinko Mikolic, compared the Bosnian government to the "Turkish occupiers." In the same town, the Catholic church features a large mural behind the altar showing the suffering of the Croat people, with portraits of a World War II Ustashe militiaman, Ranko Boban, hanging nearby. Portraits of the leader of Ustashe Croatia, Ante Pavelic, one of the most ruthless war criminals of the Nazi empire, are displayed in the homes of local Catholic priests. "They [Bosnian Muslims] sprang from bad Christians who turned Muslim because only thus could they protect their land." proclaimed that "anyone found sheltering Muslims in the Holy City would have their homes blown up." hundred-year Catholic history, by the summer of 1993 Kuharic was resisting religious nationalism of Boban and his hard-line Franciscan backers in Herzegovina, as well as the circle around Tudjman and Susak. On September 13, 1993, a new Catholic Bishop of Mostar was appointed, to whose installation ceremony at Neum (the only Bosnian town on the Adriatic Sea) Muslim clerics were invited and which they attended. The papal response is difficult to evaluate. Pope John Paul II called a conference at Assisi in January 1993 dedicated to seeking peace in the former Yugoslavia. In contrast to the statements. of the Serb Orthodox leaders, the Assisi conference participants did not single out for attention members of their own flock (in this case Catholics), but spoke with equal fervor of the suffering of all peoples in the region. Even so, the Pope never publicly denounced the role of Herzegovinian clergy in supporting the violent religious nationalism of the Herceg-Bosna militias. Nor did the Pope, who has been forceful in his visits to Latin America in reshaping the hierarchy according to his own views, exert an effective force on the Mostar clergy or visit Mostar, a few minutes' flight from Rome, to demand an end to the persecutions. Whether or not they could have been better supported by the Roman Catholic hierarchy, the moderate elements of the Bosnian Croat church and society had been marginalized by the late summer of 1993 and could only try to ameliorate, not stop, the ongoing persecutions. Pope sent a special delegate, a papal nuncio, to urge the Franciscans of sapljina to cede their parish to the bishop's control. Anti-Muslim extremist Gojko susak, the Croatian Defense Minister, visited the meeting in an apparent show of support for the Franciscans. On November 13, 1995, two high Croat officials in Herzegovina were indicted by the International Criminal Tribunal for organizing the slaughter of Muslims in fourteen Muslim villages in the Lasva Valley. After the indictments, Croatian President Tudjman announced that rather than arresting indicted warcriminal General Tihomir Blaskis, he was promoting him. Tudjman made the announcement in Dayton, Ohio, where he had promised to cooperate with the International Criminal Tribunal and to detain suspects for trial. The other suspect, Dario Kordis, had been placed by Tudjman at the head of the HDZ in Herzegovina over more moderate candidates; after the Lasva Valley atrocities, he was decorated for increasing Croatia's "position and prestige." 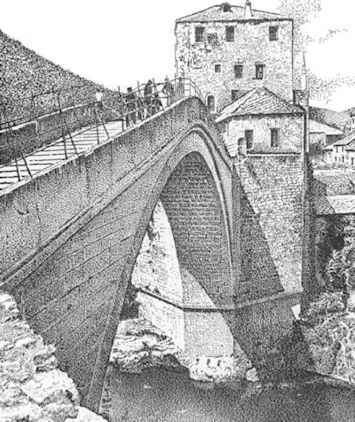 The Old Bridge (Stari most ) in Mostar: symbol of a multi-religious heritage, constructed in 1561 and destroyed by Croatian religious nationalists in 1993. From Husref Redsis, Studije o Islamskoj arhitektonskoj bastini (Sarajevo: Veselin Maslesa, 1983). Bridge of Mostar, which had stood since 1561 as a symbol of Bosnia's role in bridging cultures. The destruction fit Tudjman's desire to be accepted by Europe and to cut his Catholic Croat nation off from any association with the "Orient" of Serbs, Muslims, and Jews. Tudjman depends upon the major Western European powers for economic, political, and cultural support. After "Europeanizing" Bosnia, he awaits his reward. Herzegovinian Catholics call the Madonna of Medjugorje Gospa (Lady). Catholic theologians maintain that a true vision will lead to changed and morally responsible behavior on the part of those who experience it. If the Madonna of Medjugorje did insist on peace one wonders why those who heard her message gave such little thought to the Muslims confined to concentration camps at Gabela, sapljina, Dretelj, Ljubuski, and Rodos, all within a few miles of Medjugorje. Did those busloads of pilgrims, filled with inner light and joy, hear the screams from the other side of the Medjugorje hills? What symbols were given to the bosnians in concentration camps?